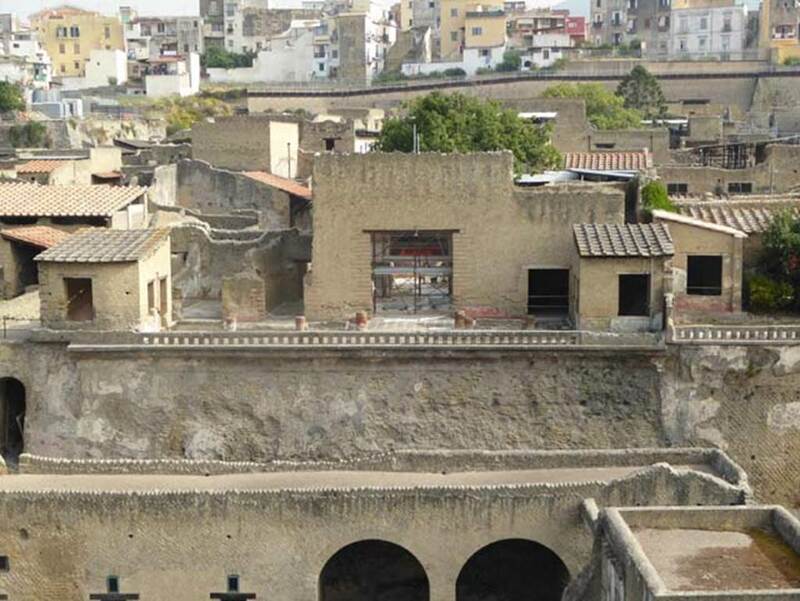 Herculaneum IV.1. 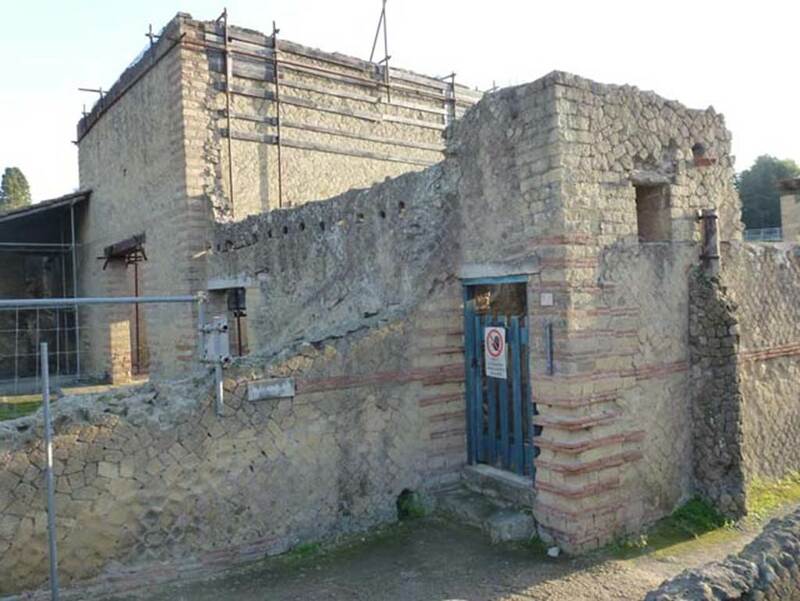 Rear entrance of IV.2, Casa dell’ Atrio a mosaico or House of the Mosaic Atrium. Linked to IV.2. 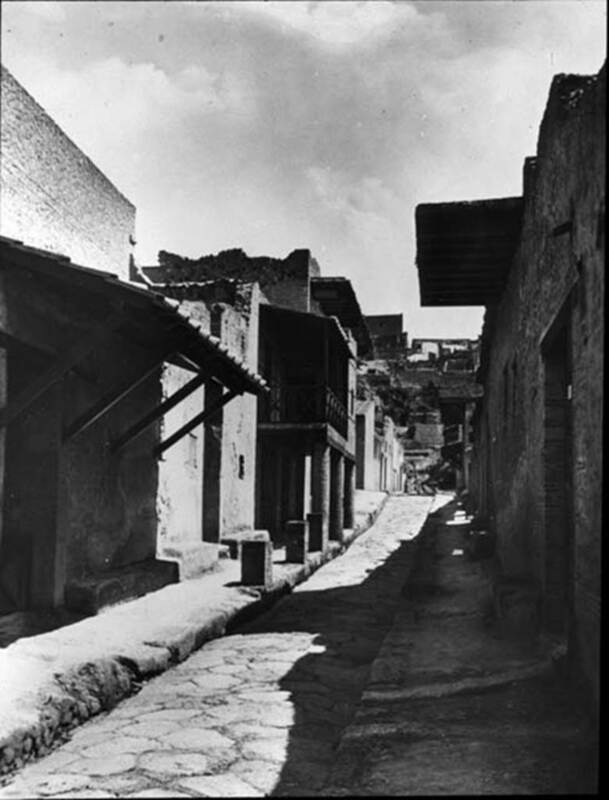 Excavated 1929-30. According to Maiuri, the “Old excavations” comprised of Ins. II, and the lower area of Ins. VII. The “New excavations” comprised of Ins. III and IV along the Cardo IV. 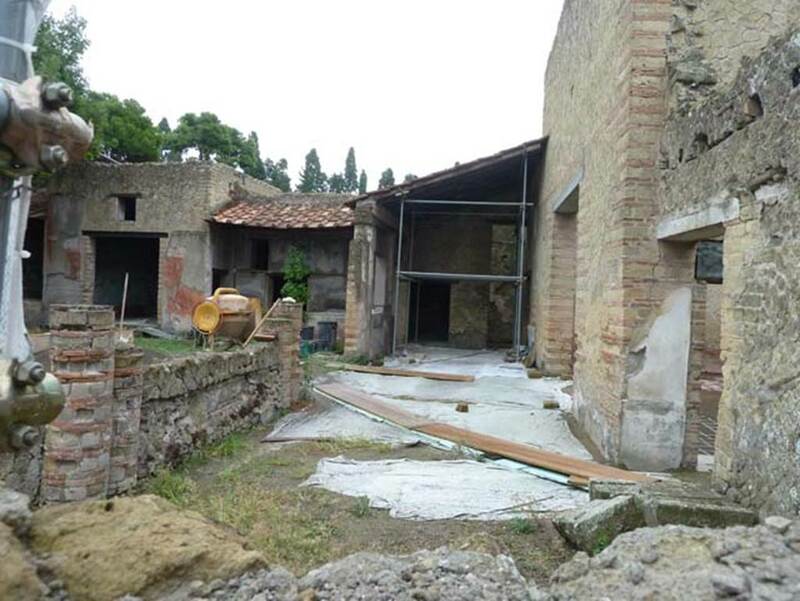 According to Pesando and Guidobaldi, Insula IV was fully excavated into the open air between 1929 and 1932. See Pesando, F. and Guidobaldi, M.P. (2006). Pompei, Oplontis, Ercolano, Stabiae. Editori Laterza, (p.328). 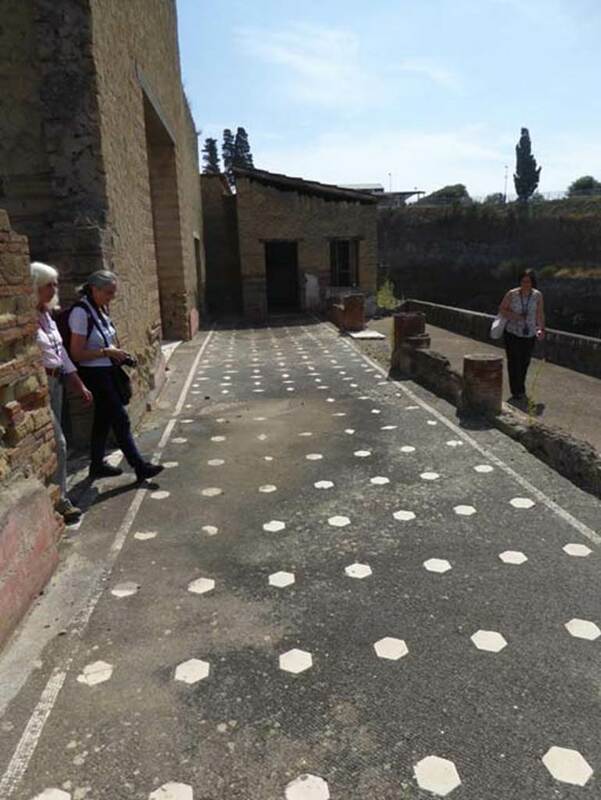 Cardo IV Inferiore, Herculaneum, September 2015. Looking south-east towards doorway to Ins. IV.1, on left. On the right, blocked, is another of the routes to the beach, found at the southern end of the roadways. Cardo IV Inferiore, centre. 1978. Below the roadway is the vaulted passageway (blocked) leading via a ramp, to the beachfront. 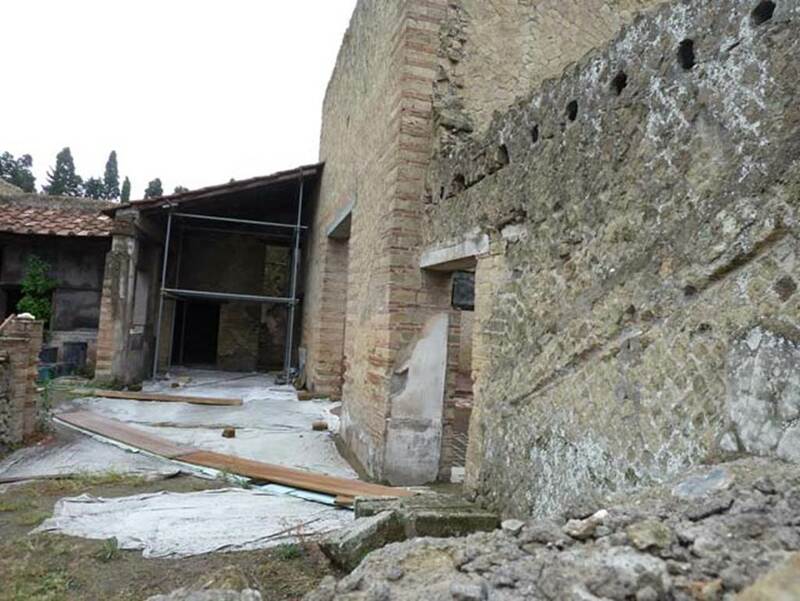 On the left is part of III.19/18, and on the right is IV.1/2, the House of the Mosaic Atrium, looking north towards the terrace. Photo courtesy of Roberta Falanelli. 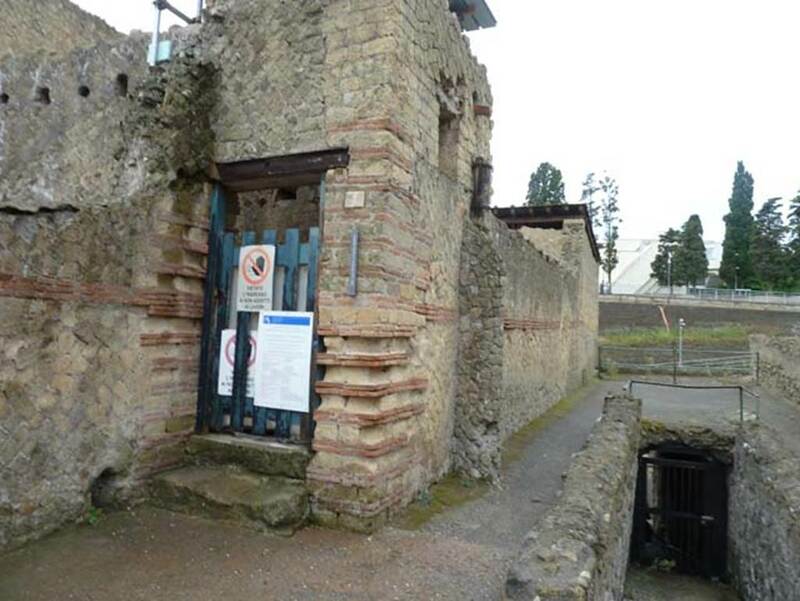 IV.2/1, Herculaneum, October 2014. Looking east across Cardo IV at its southern end, towards side wall of IV.2/1. 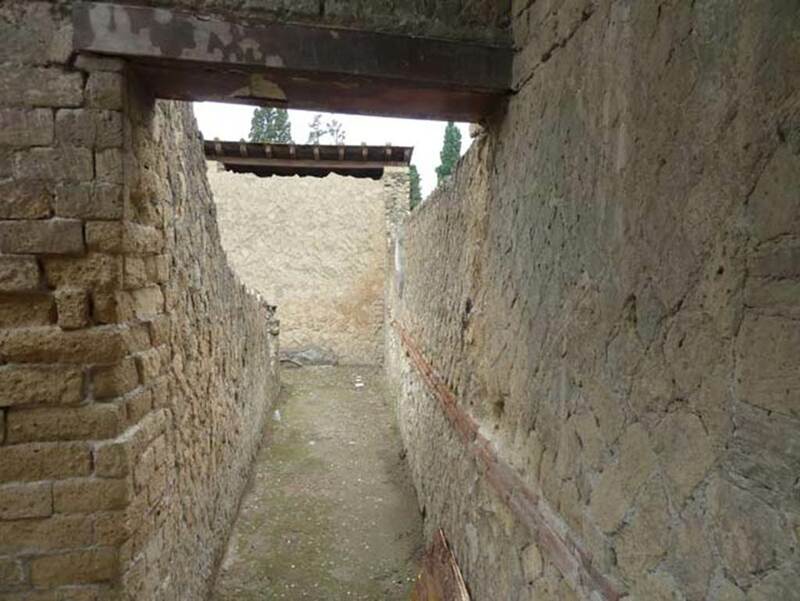 IV.2/1, Herculaneum, October 2012. Looking south-east at end of Cardo IV Inferiore, towards south end of Casa dell’Atrio a Mosaico. 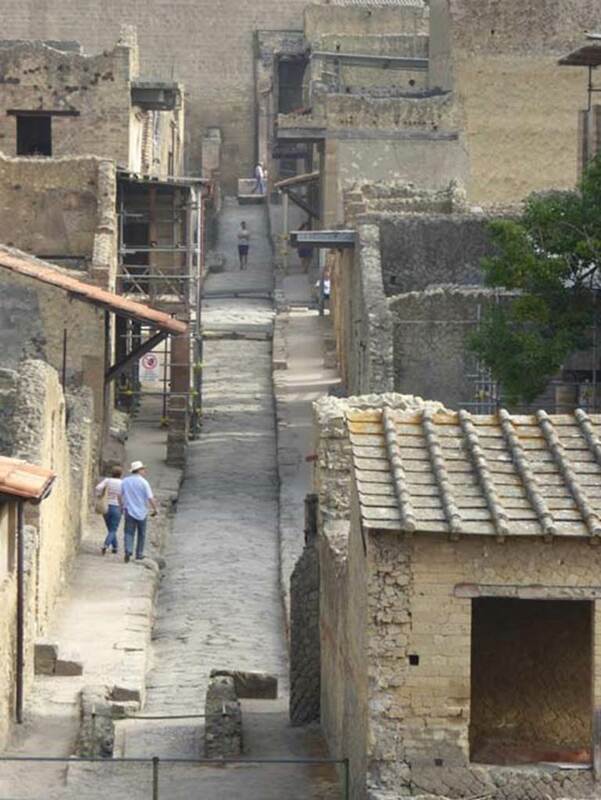 IV.2/1, Herculaneum, June 2005. Looking towards entrance doorway at south end of Cardo IV. Inferiore. 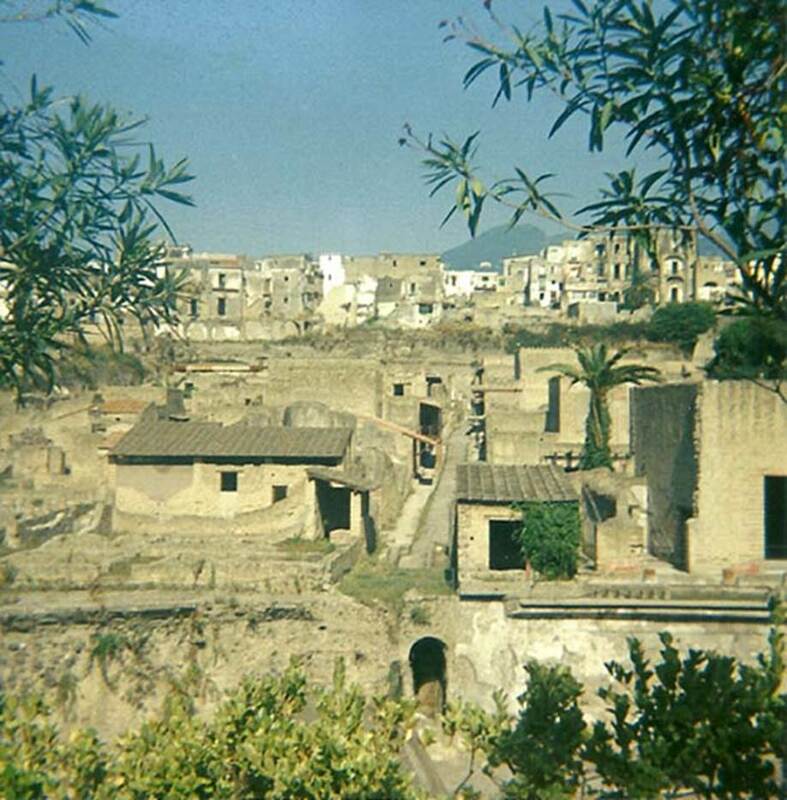 IV.2/1, Herculaneum, June 2005. Downpipe at south end of western façade, near end of Cardo IV. Inferiore. 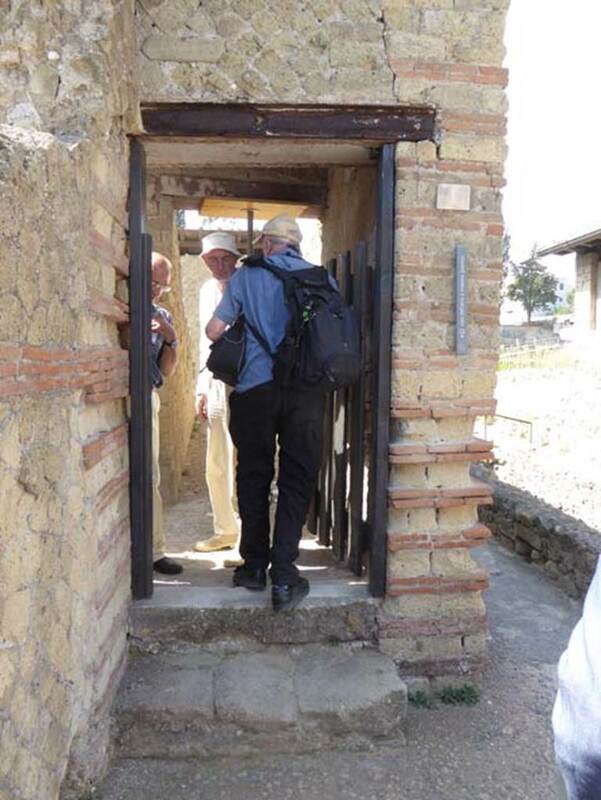 Looking towards “open” entrance doorway for the Herculaneum Society visit. 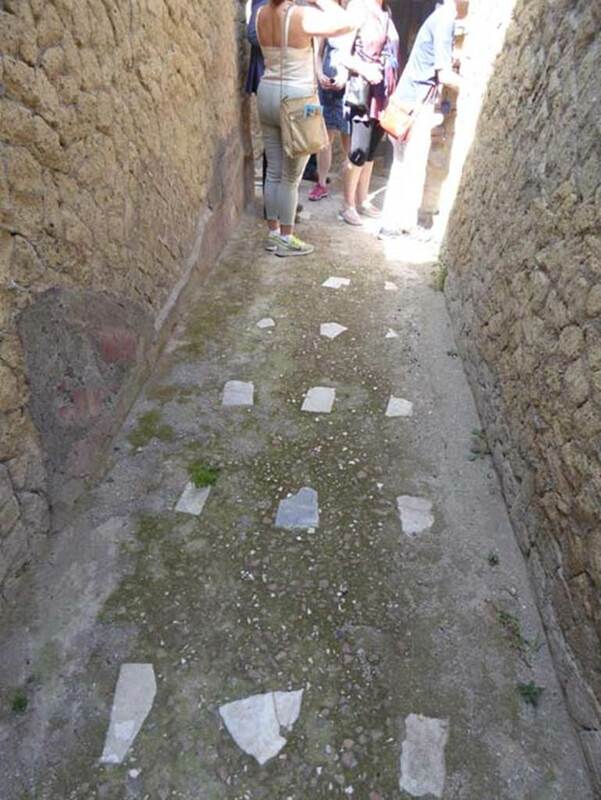 IV.1, Herculaneum, October 2014. Entrance doorway, looking south. 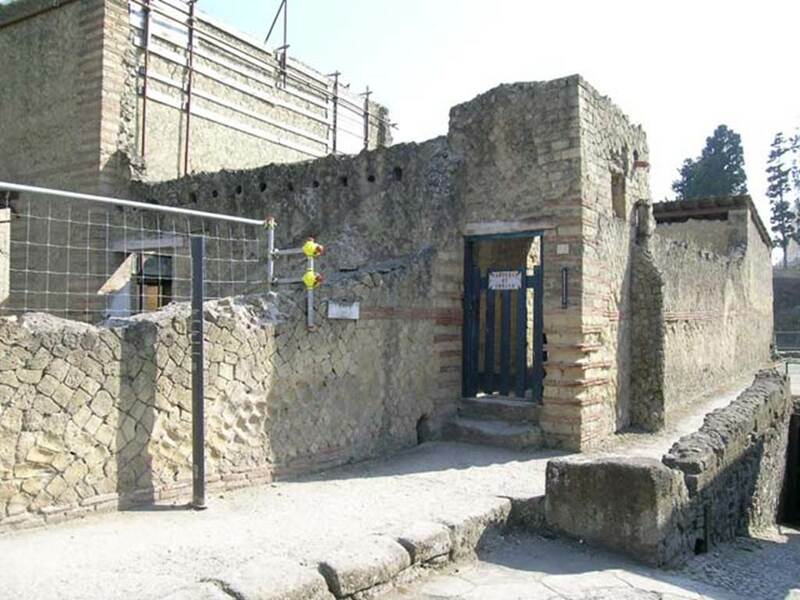 IV.1, Herculaneum, June 2005. 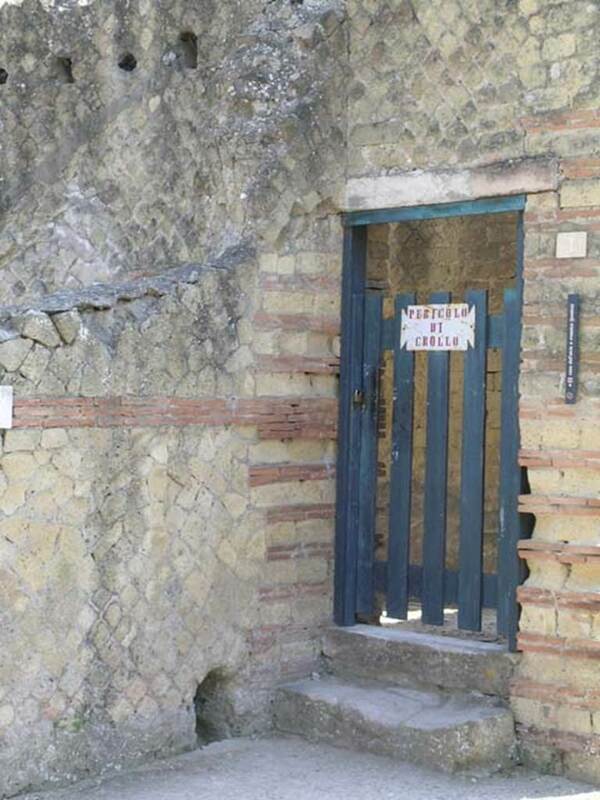 Entrance doorway, with notice “Pericolo di Crollo”, (Danger of collapse). 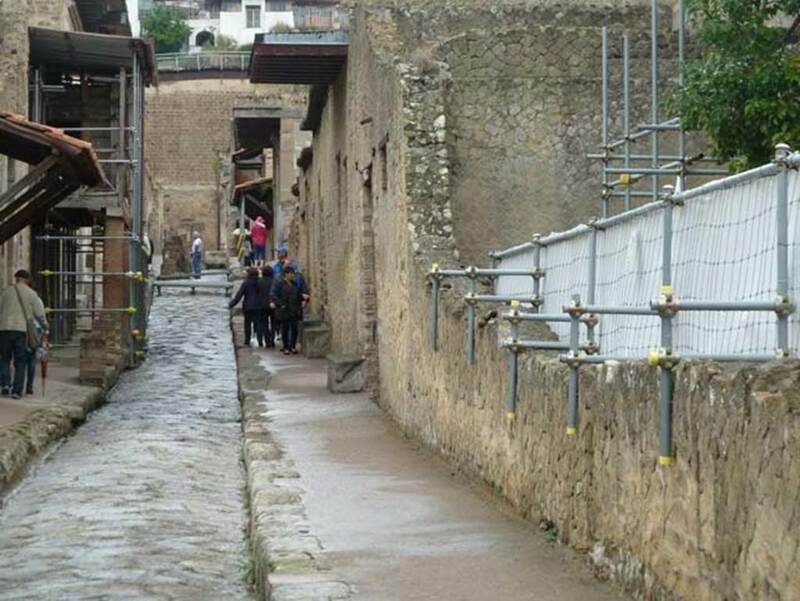 IV.1, Herculaneum, September 2015. Looking south along corridor 19 leading towards rooms overlooking terrace, taken from entrance doorway. 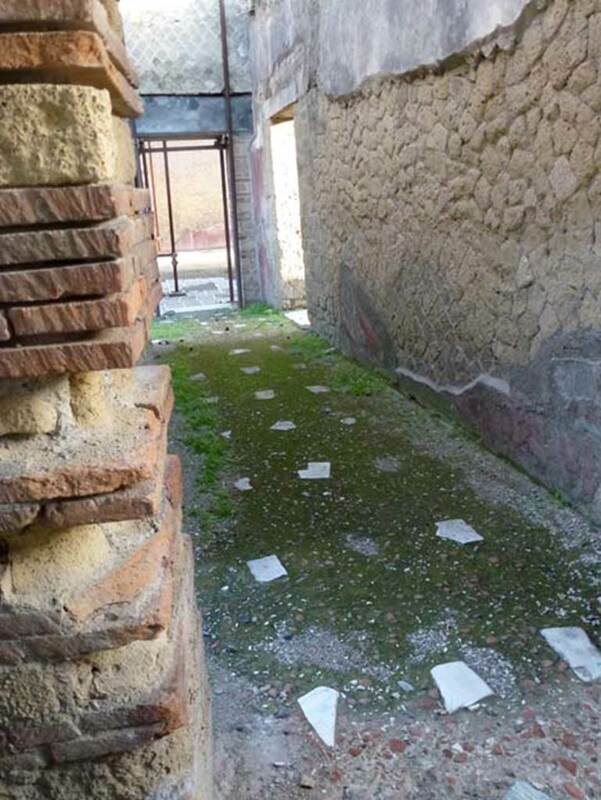 IV.1, Herculaneum, October 2014. Looking north towards terrace and rooms looking onto it, taken from access roadway. Looking east across covered portico, and onto terrace which would have overlooked the beachfront. 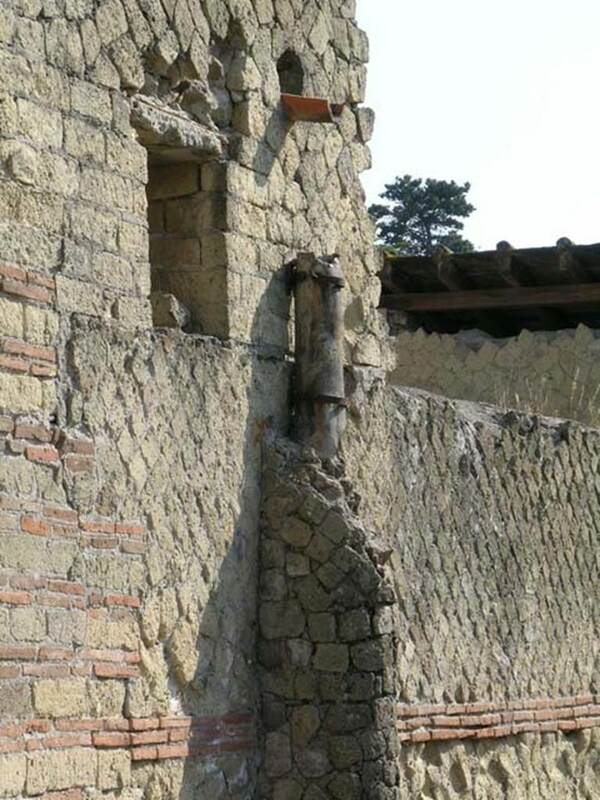 IV.1, Herculaneum, October 2012. Looking east along corridor 20 towards room 12, taken from entrance doorway. 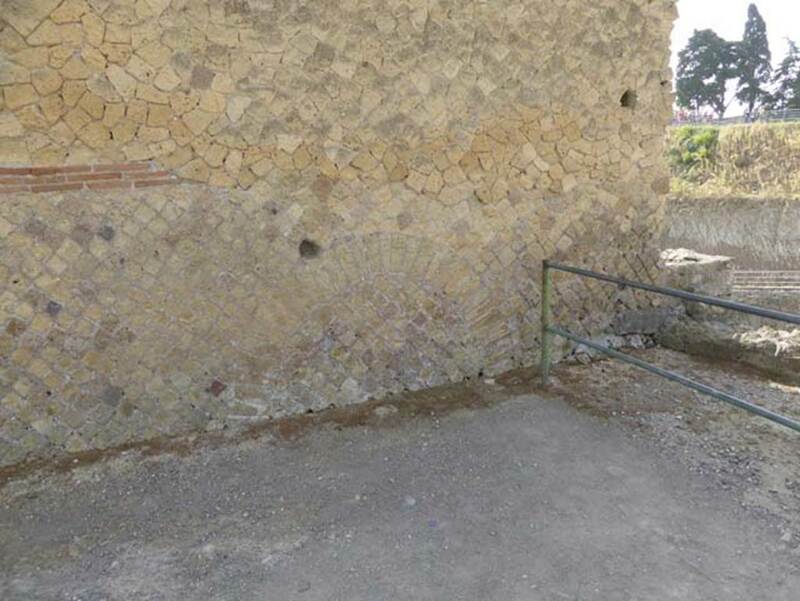 IV.2/1, Herculaneum, September 2015. Looking east across south portico of garden area, during restoration. 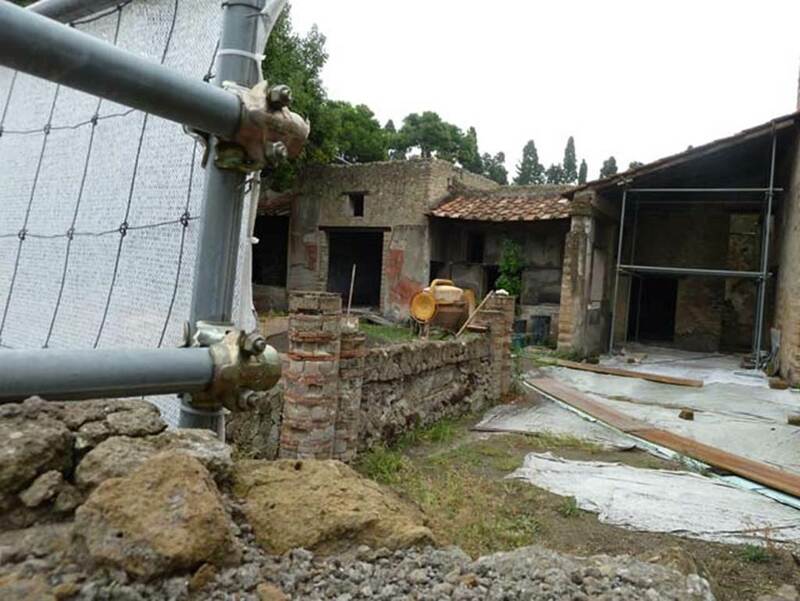 IV.2/1, Herculaneum, September 2015. Looking east across south wall of portico. 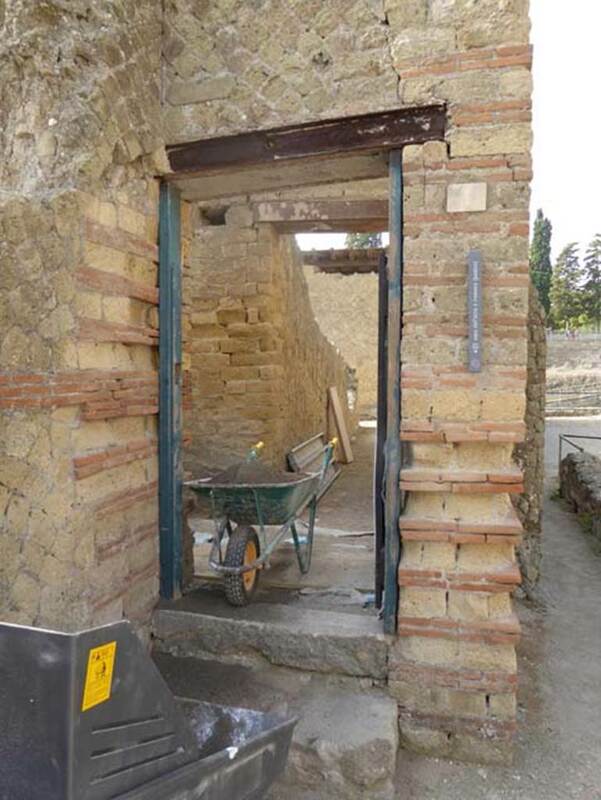 IV.2/1, Herculaneum, September 2015. Looking north-east across south portico of garden area, during restoration. 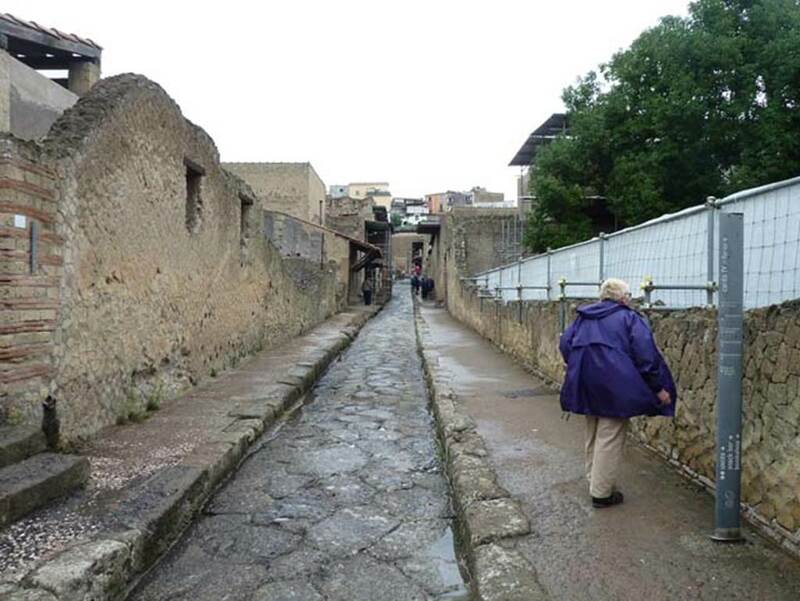 Cardo IV Inferiore, Herculaneum, September 2015. Looking north between Ins. III, on left, and Ins. IV, 2/1 on right. Cardo IV Inferiore, Herculaneum, September 2015. Looking north between Ins. III, 17 on left, and Ins. IV, 2/1 on right. Cardo IV Inferiore, Herculaneum, October 2014. Looking north from access roadway, between Ins. III, on left, and Ins. IV, 2/1 on right.